Part of our calling as ministers of the gospel is to create opportunities for people to think about spiritual things and God Himself. We pray that as people take time to process these deeper questions, they would grow in their curiosity and that their hearts would be open to hearing about how God is a personal God who wants a relationship with them. A few times a year, we put on larger outreaches to help create a dialogue about spiritual things. 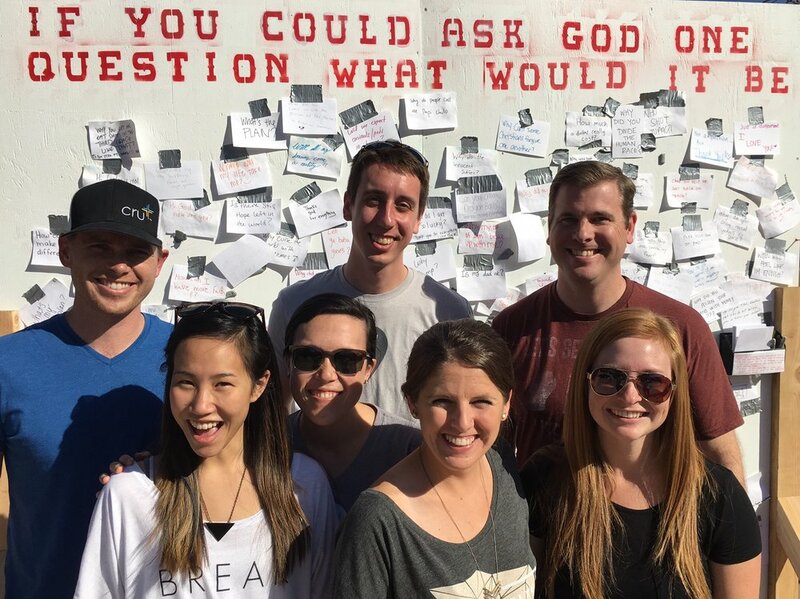 This past month we put a board up on Cal State Fullerton’s campus that asked, “If you could ask God one question what would it be?” Hundreds filled out cards and posted them to the wall. You can read some of the questions they asked above. Our staff and students were around to further engage with students who wanted to talk more about what they wrote and why. Then, they prayerfully ask if the student would be interested in learning more about God and His loving plan for them. This was a great step of faith for our students and a wonderful way to engage in gospel conversations with those whose hearts were in a teachable place. As staff and students continue to follow up and engage with students in further conversations, please pray that the gospel will transform lives! You are a part of reaching this next generation with the gospel and we are eternally grateful! Matt’s grandfather, Darrell Davis, took his final breath on earth (March 13, 2017) and his first celestial breath of heavenly air. A week before he passed away, Matt was able to share with his Grandpa all the great qualities he saw in him over the years and how grateful he was that his Grandpa was bold enough to share Jesus with his kids because they shared with Matt who is now sharing with his kids. Grandpa, we are so thankful for the legacy you are leaving and the positive rippling effect for years to come. Thank you for your prayers and support so that more students could be challenged to walk with Jesus and share Jesus with others!